How many know that a famous Brentwood-Byron pioneer, Robert Dean, was responsible for naming Lake Tahoe? Dean was born in Poughkeepsie, NY in 1831. Arriving in California in 1850, he first tried his luck in the gold fields. By 1853 he was working in the Brentwood area as a haying hand on Dr. John Marsh's huge rancho, Los Meganos. In 1854 Robert was collecting blueberries along the banks of the San Joaquin River near Stockton when a giant grizzly attacked. Only the arrival of friends saved his life. The bear was killed but only after Dean’s abdomen was ripped open by the enraged beast. Robert Dean spent the next six-months recovering from his dreadful wounds. Robert eventually returned to the gold fields, ran a hotel in the Sierras, and participated in the famous Comstock silver rush. Dean returned to Brentwood in 1870 and worked for the Balfour-Guthrie and McNear grain interests. As a businessman, banker and newspaper writer, Dean was well known throughout the county. This article is largely based on his personal papers that were recently donated to the Contra Costa History Society. In Dean's own handwriting there is a detailed description of how Lake Tahoe received its name. These notes were the basis for a short article that appeared in a 1908 edition of Sunset Magazine. In 1852 the state legislature received word that a large, ill-prepared party of immigrants were attempting to cross the Sierras. Money was hastily appropriated and the Democratic Governor, John Bigler, quickly dispatched supplies to the Sierras. Governor Bigler and friends arrived in the Tahoe basin with the supply-laden pack train. In those early days Lake Tahoe was informally known as "Mountain Lake." The Governor and his friends took the opportunity to enjoy the valley’s excellent fishing and hunting. Evidently the behavior of our politicians has changed little in 150 years. Although in reality, it was the California taxpayers who were responsible, the Governor had few problems accepting the credit from the grateful immigrants. Bigler’s large party then proceeded to Hangtown (later known as Placerville). A large, festive banquet was held in appreciation of the immigrants’ rescue. After the participants had swallowed numerous toasts, one of the Governor’s friends proposed that Mountain Lake be renamed "Bigler Lake." The well-oiled crowd enthusiastically adopted this suggestion. For the next ten years "Bigler Lake" went unchallenged. With the outbreak of the Civil War, John Bigler was revealed as a strong Southern, pro-slavery sympathizer and an active participant in a plot to separate California from the Union. In 1862 Robert Dean was the manager of a popular resort hotel beside Bigler Lake. Dean was a stanch Republican and strong Lincoln supporter. He became increasingly upset that this beautiful lake was named after a Lincoln hater and active Confederate sympathizer. During the long evening sitting around the hotel’s fireplace the hotel residents discussed the bloody events on the Eastern battlefields. Dean and his guests decided that the least that they could do for the Union cause was to rid California of this monument to Bigler’s rebel memory. After a few drinks to lubricate their imaginations, they agreed that the best name would be the one used by the Native Americans who lived near the lake. The next day Dean visited Captain Jim, leader of the local Walker River Indians. Captain Jim told Dean that their traditional name for the lake was Taahoo or "big water." When Dean reported back to his friends and guests, the Indian name was adopted by unanimous consent. It was decided that the lake would now be known as "Lake Tahoo." 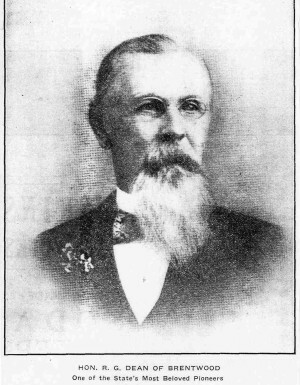 With the approval of his friends, Robert Dean wrote to the Republican editors of the Sacramento Union, at that time one of the most influential newspapers in the state. The newspaper embraced his suggestion and published a fiery editorial supporting the new name for the Sierra lake. Other pro-Union newspapers took up the cause. The patriotic and generally pro-Union public very quickly accepted the new name. However there was one slight accident. Due to a typo in the Union’s original editorial, the lake now became known throughout California as "Lake Tahoe" rather than "Lake Tahoo." However, as it turned out, the fight over naming Lake Tahoe was far from over. After the Civil War, the Republican Party split over nominating a gubernatorial candidate. John Bidwell was defeated at the 1867 Republican nominating convention by an unpopular candidate from Southern California. The Republicans were in disarray, which led to a subsequent sweep of the state house and legislature by a resurgent Democratic Party. Revenge was sweet for the jubilant Democrats. One of the first item on their political agenda was to erase the Republican insult to the memory of their beloved Bigler. After a short but intense lobbying campaign, the legislature overwhelmingly passed a bill officially renaming the magnificent body of water, "Bigler Lake." Official state documents and maps were soon published referring to the giant lake as "Bigler Lake." Nevertheless the general public wisely ignored the command of the state legislature. Within a few years the "Bigler Lake" name was forgotten. The Republican dominated federal government also ignored the Democratic name change. On federal topographic and geologic maps "Lake Tahoe" continued as the primary, recognized name. In 1870 Mr. Dean returned to Brentwood and was sometime later made superintendent of the old Marsh Rancho, where he had once worked as a haying hand. He also became a successful banker and grain shipper, building warehouses at Brentwood and Byron. Perhaps his most enjoyable personal activity was as a part-time correspondent for the Byron Times. He wrote a gossipy, weekly column (the "rye-patch gang") that poked fun at the foibles of the local citizens. He was proud of his historic role in naming Lake Tahoe. On April 14, 1920 Robert Dean died, a famous and beloved local pioneer who had seen the transition of California from a primitive, raw frontier to a state filled with prosperous farms and modern cities. In fairness it should be noted that the act renaming the water body as "Bigler Lake" has never been officially rescinded by our legislature. Therefore, diehard Democrats would probably enjoy the snowboarding best at Bigler Lake. The few remaining California Republicans would likely prefer skiing at Lake Tahoe. Personal papers and scrapbook of R.G. Dean, Contra Costa History Center archives.